Public Works operates from the Town Garage on McCully Street in Amherst. The Public Works staff consists of a director, operations manager, transportation foreman, engineering service manager, clerk and 24 full-time and seasonal employees who are responsible for the planning, operations and maintenance of the town streets, sidewalks, snow and ice removal, traffic control lights located in the town, sewers, storm drainage, equipment and the water utility. For after-hours Public Works emergencies call our dispatch center at 902-667-7227. During major snow storms in Amherst you may call our snowline at 902-664-6000 for information on street conditions and snow clearing/removal with in the Town of Amherst. 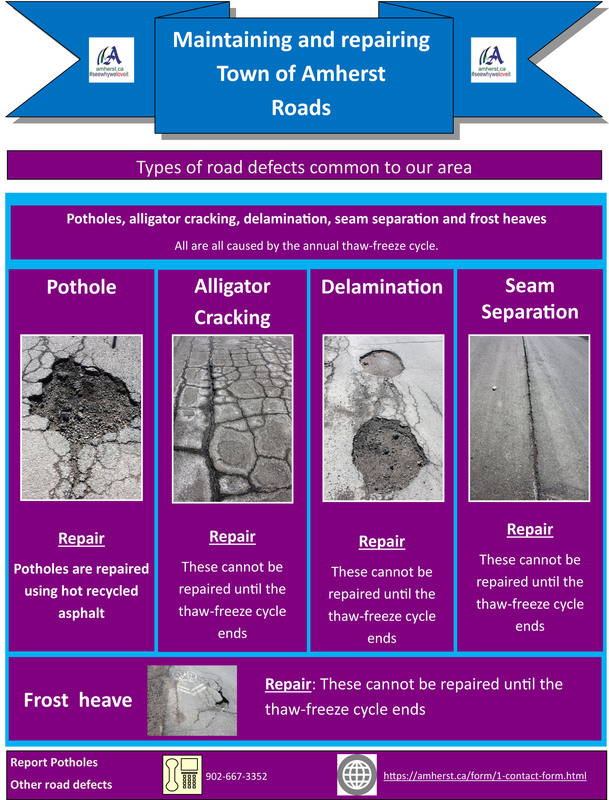 Potholes are created each year through the regular thaw-freeze cycle, which is the reason they seem to proliferate during springtime. The temperature rises, snow melts, water seeps through tiny cracks in the pavement into the street’s subbase. When the temperature drops, the water refreezes, becoming ice that expands, which in turn forces the pavement above it and the ground below it to flex. As traffic drives over the flexing street, the pavement weakens. Eventually, it weakens to the point where the asphalt pops out and exposes the street’s subbase. 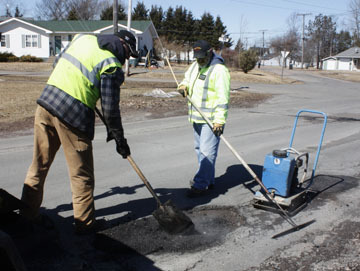 Town of Amherst Operations Department crews work to repair potholes during the winter and spring. Repairs are triggered by the town becoming aware of the potholes. This is done through staff monitoring of streets and citizens reporting potholes. Citizens are encouraged to report potholes. Doing so creates a work order, which triggers an inspection of the pothole. Based on a number of factors - available resources, damage that could occur, size, location, traffic volume on the street - the pothole is prioritized and addressed. The greater the hazard, the higher the priority to fix, however, not all potholes need to be, or can be, repaired right away. Some are addressed in other ways, such as with a pylon or barricade. You can report a pothole by calling customer service at 902-667-3352 or using the contact page on the town's website.